Increased resistance coming soon or is here? 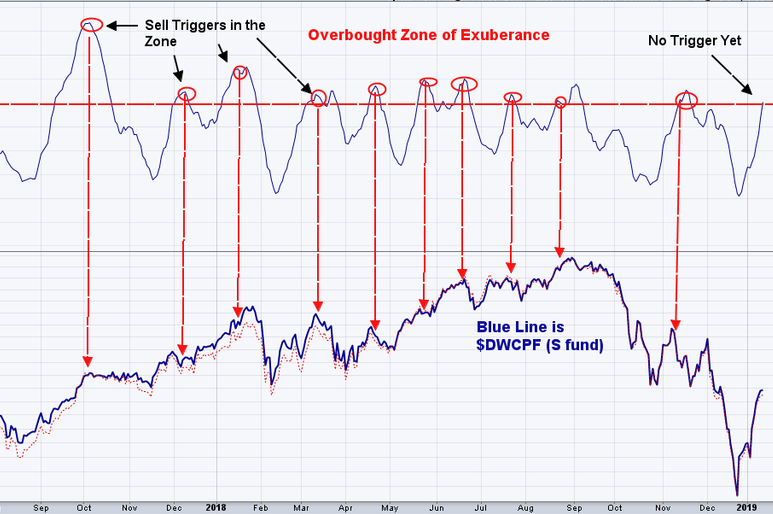 What considerations should be given to stocks being overbought? Been some talk about it, and people voicing concerns. On the flip side, some people see the strong rallying as a sign to be optimistic. That the market has risen far-n-fast as a good sign. A reaction to the oversold (dipped too low, too fast). With expectancy that the rallying will attract a lot more investor’s attention, with more buying. I to think we have entered the zone for extra considerations. And I would have concerns about buying now. There might be a higher level of risk for possible gain. Eventually, it will reach a price point that buyers think is too high. They will stop buying and start to take profits. So with limited transfers, what’s a poor Ole TSP market timer to do? Eventually there will be a shift and sellers will start to outnumber buyers. I believe that turning point can not be known in advance, only after the results come in each day. 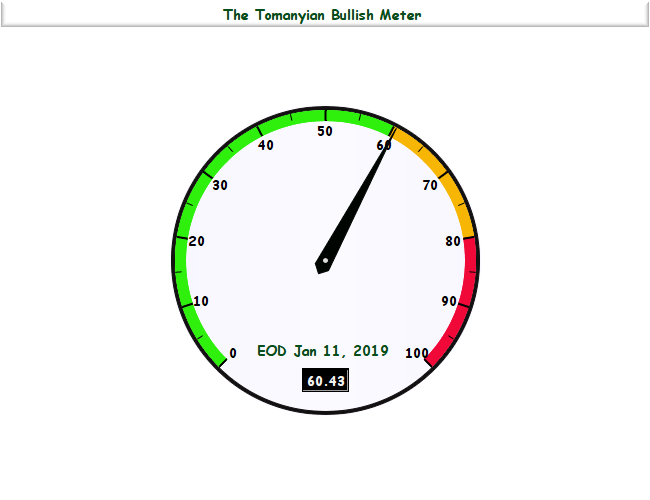 Presented here is the Tomanyian Bullish Meter, (please excuse my amour-propre). It has a 0-100 range. Its calculations incorporates both price and volume changes. With some looking back, I see 60 as the start of the zone of exuberance. But sometimes exuberance breeds more exuberance. So I looked for what caused the scare alarm to go off. That’s easy, a sudden dip in money flow. As you can see on the 2nd chart it's not perfect. And I can’t guarantee that this system will outsmart the market all the time. Most often it will be late, a few time early. But I can tell you that this indicator is better than half of the other ones out there. And produce results that are tuned to the ongoing market conditions. Friday's reading had no reduction, with no sell trigger.